KSRealityBites: Epilepsy drugs can increase fracture risk in older adults! Epilepsy drugs can increase fracture risk in older adults! CANADA: A new research study claims that the chronic neurological disorder Epilepsy that is found in most of the young children, the drugs prescribed for the disease can increase the bone fracture risk in older adults. Canadian researchers said that all the Epilepsy drugs are associated with the risk of non-traumatic fractures in the patient over 50 years of age. The anti-epilepsy drugs including carbamazepine (Carbatrol, Epitol, Tegretol), clonazepam (Klonopin), ethosuximide (Zarontin), gabapentin (Gabarone, Neurontin), phenobarbital (Luminal), phenytoin (Dilantin, Phenytek) & valproic acid (Depakene, Depakote) are best prescribed for treating the disease. 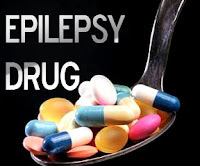 Researchers said that even though the neurological disorder Epilepsy is usually kept controlled by medication, all the drugs 've the side effects.The study published in the Archives of Neurology found that the drugs phenytoin & carbamazepine 've the greater chance of developing fractures. However, the Valproic acid is the only drug that is not linked to the risk of fractures. If U like this post then please promote!